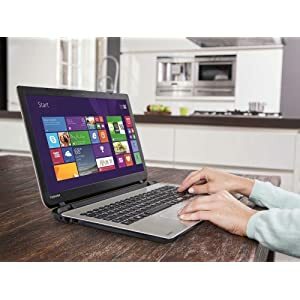 Toshiba L50-B-1UV 15.6" Quad Core Laptop Intel Pentium N3540 8GB RAM, 1TB HDD. Note: Images and Videos are only for illustration purposes. Please refer to technical specs for exact model and details. Available in Pearl White Colour. Windows gives you a great experience at a great value. Get an extensive selection of popular apps in the Windows Store and play games, music and videos online or offline. 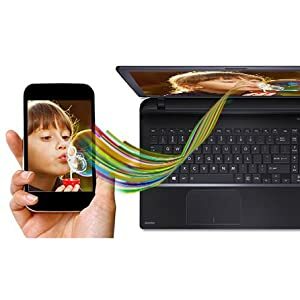 You can run familiar and reliable software without being dependent on an Internet connection or limited to web-based apps. Whatever you're into, the super-slim Satellite L50-B series laptop has everything to keep you entertained. Measuring just 23 mm thin*, and weighing from just 2.2 KG, you can take the L50-B anywhere. With a wide range of multimedia options - including a choice of Intel and AMD processors* and optional DVD SuperMulti drive*** - you'll have all you need to connect to your world. 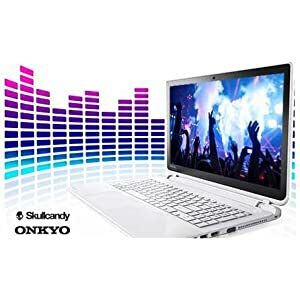 The laptop's Skullcandy-tuned speakers and headphone jack, combined with DTS Sound audio enhancement means your audio will be richer, deeper and more vibrant. The L50-B's frameless tile keyboard and large click pad look great and make input easy too. So, whether you're into movies, socialising online, web surfing or photography, you can stay entertained by richer sound and graphics on a 15.6" display - wherever you go. The Satellite L50-B is designed to be super-slim in size but big on features. Its distinctive looks offers comfortable, tactile feedback, thanks to a frameless tile keyboard and large click pad. And at just 23 mm thin* with a choice of colours, you will want to take the L50-B everywhere. With the Skullcandy-tuned speakers combined with DTS Sound, your audio will be richer and deeper. These built-in speakers create a well-balanced soundstage, so you can immerse yourself in realistic surround sound every time you stream a movie, watch a video, play games or listen to music. The integrated Skullcandy-tuned stereo speakers are positioned below the screen and combine with DTS Sound audio suite to ensure that music or movie soundtracks can be enjoyed at their best. DTS Sound includes a sound enrichment suite that boosts volume, enhances bass and improves definition. Enjoy immersive audio complete with deep, rich bass and crystal clear dialogue. DTS Sound also delivers high-frequency definition for crisp detail in any listening environment, ensuring users a premium and natural entertainment experience whether you are using the laptop speakers or headphones. Fully immerse yourself in your favourite movies and online content, thanks to the Satellite L50-B's 15.6" display and choice of integrated Intel HD graphics*, or external AMD Radeon R series graphics*. You can see everything clearly on the HD screen - or, on selected models, watch the Full HD content stored on your laptop on an Full HD capable TV by using the L50's HDMI-out port**. To ensure the picture is super-sharp at all times, Toshiba's built-in Resolution+ technology will enhance the quality of your video and photo content in real-time.